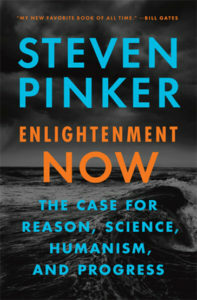 We chose Enlightenment Now: The Case for Reason, Science, Humanism, and Progress by Steven Pinker because we were curious about Pinker’s primary argument: Reason, science, and humanism – key themes of the Enlightenment now – lead to progress. Pinker’s case for progress rests primarily on descriptive and visual statistics organized by topic areas, each of which is well-worth reading. However, we ended up being more interested in three side discussions in the book. The first involved media cynicism, where Borstein and Rosenberg theorize that the Vietnam and Watergate eras mark the media’s shift from “glorifying leaders to checking their power,” all of which now shows up as cynicism (Pinker 2018, 50). We discussed competing theories, as well as the implications for society if this theory holds. The second side discussion was on the topic of mitigating climate change, with Pinker’s suggestions including, inter alia, carbon pricing, nuclear energy, and mild geoengineering. We speculate what might be next when/if these solutions do not work. 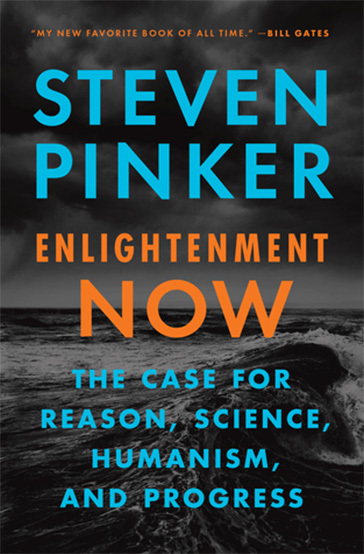 Our third discussion touched on society’s perceived hostility to science, and Pinker’s assertion that it may be because people view science as a cause for genocide and war, or because it may be a threat to the moral and spiritual health of our nation (Pinker 2018, 389). We discussed this topic on its merits and considered mitigating approaches. The case for reason, science, humanism, and progress was interesting, but our bigger take-aways were: the frame for humanity’s progress has to be longer-term and larger-scale; a positive change over time is different than a fast-rate of change; and the need for systematic attention to the individual- and community-level impacts, effects, and progress. We viewed these points from our team’s shared interest in futures, and how we can implement more of what we know about the past into shaping the potentialities for society’s future.